We have written quite a few posts referring our readers to outside sources that help young readers find books they’ll love. Now, we’re proud to point you toward a resource of our own! If you have a Goodreads account, you can sign up to follow The Yellin Center and take advantage of our large list of recommended titles! Goodreads, for those who don’t yet use it, is an online networking site for book lovers. After creating a free account, users have lots of options. They can add friends to get updates about books their connections are reading and learn about what books their friends loved and hated. The site is also a great way to keep track of book lists; users can search for books by title or author or by browsing themed lists created by other users, then save books that they've read or books they want to read. Completed books can be rated, and users can even write their own reviews. It’s also possible to create share-able lists (some titles are “Zombies!” and “Books a Middle Schooler Should Read”) using the Listopia function. One the most fun aspects of this feature is that other users can vote on the books in your list, which will rank the titles accordingly. Each user will have the option of using pre-named shelves (Want to Read, Currently Reading, and Read) and also adding shelves they name themselves. 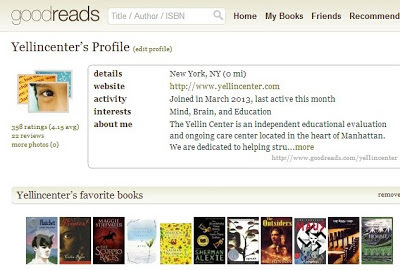 Our Goodreads account is designed to share our favorite books with a wide audience. After “friending” us you can browse through our list of more than 350 (and growing) titles. We've placed our books on shelves according to reading level, genre, and theme, and included other information such as whether there is a movie adaptation of the book available. We also have shelves for books that are great for reading aloud, books about parenting, books about teaching and learning, and books about the brain. And we've actually read all of the books on our list, which means we can confidently stand behind our categories, ratings, and reviews. We hope you’ll investigate our page and take advantage of this resource! Feel free to share it with others, and let us know what titles we should check out next.